"Before the CPC implemented the 'Three Represents' and allowed private entrepreneurs who had met the requirements to join the Party back in 2001, the number of private businessmen who were Party members accounted for a large proportion of the total number of private entrepreneurs. And many had already become Party members even before they started their own business," Su said. Membership of the Party and corporate management are two unrelated things, Su noted. 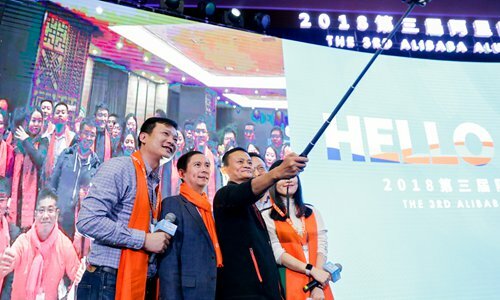 "The board of shareholders is in charge of decision-making and daily operations, while Party cells are set up to make sure the company's operations are in line with the principles and policies of the CPC," he said. China recently released a trial regulation for Party branches stating that Party cells inside private firms can help guide and supervise enterprises to follow the country's laws and regulations and safeguard the legitimate interests of all parties, according to a document released on Sunday. "It's crystal clear what role Party branches play in private companies," Su said, noting that Party cells are not established with the aim of replacing management teams or meddling in decision-making processes. Alibaba established its Party branch in 2000 and upgraded it to a Party committee in 2008 due to the company's growing number of Party members, according to media reports. Alibaba now has nearly 200 Party branches and about 7,000 Party members. Ma highlighted the importance of Party construction work with younger generations, pledging to explore Party building inside high-tech firms in the new era. "We hire graduates every year and some of them are Party members, who usually work hard and are eager to learn, creating a positive work environment," Liu Ren, vice general manager of Dailywin Watch Group, told the Global Times Tuesday. Tech firms such as iFlytek and smartphone maker Xiaomi have been strengthening their Party construction work. "The rapid development of iFlytek is thanks to the correct guidance of the CPC and the hard work of Party comrades, who are also the backbone of our management team," Wu Dehai, Party chief of the CPC committee of the company, told the Global Times in a recent interview. The private sector is a key part of China's reform and opening-up, and it has been developing with Chinese characteristics, Su noted. "The interests of shareholders of listed private companies do not contradict the core interests of the CPC, as the Party also wants to pursue opening-up and economic growth," he said.